Take grey, rainy Sundays where the sky will either break into blue or descend as powerful drops. Add one day off, a pair of Sperry Topsiders, the city of Boston and a bored writer. Wandering through areas I know well, and neighborhoods with interesting buildings is a perfect way to spend the afternoon. I’ve wanted to see the Rose Garden for a while now, having sprinted passed it a couple of months ago, so I figured today would be as good a day as any. 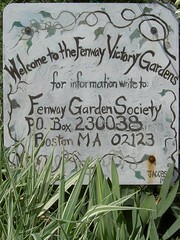 The same goes with the Fenway Victory Gardens. Feeling bold, I walked amongst the gardens, peering into them and snapping a few pictures. The creativity of others is inspiring. A few lines for poetry snuck into my head as I viewed hidden garden after hidden garden.